Brands have used ambassadors for as long as there have been brands. Even in the 1700s the royal family was talking up Josiah Wedgwood’s pottery, and today Wedgwood is a household name. Branding works, but things are starting to shift. People no longer want to hear from marketing campaigns and paid celebrities. People want to hear from regular people just like them, and this has given rise to the era of the social media influencer. When social media was brand new, many brands treated it simply as free advertising. In reality there’s nothing free about it – you get out of it what you put into it. If you just use social media to plaster your messages all over the place your audience will quickly tune you out. Whereas many brands still think of social media as a billboard, smart brands think of it more as a telephone used to communicate and build relationships with customers. In the early days of social media brands jumped on the paid celebrity endorsement bandwagon. After all, they were already famous and it was seen as a new way to leverage their fame. Selena Gomez was posting about Coach and DJ Khaled was posting about Ciroc. Unfortunately with paid celebrity posts, oftentimes there’s no engagement with customers – they just post and run. This poses a problem for the authenticity of the post. People trust regular folks for recommendations more than they trust celebrities, even if those regular folks are online. Nearly 90% of people trust online recommendations as much as in person recommendations, and 70% of teens say that YouTubers are more relatable than celebrities. Celebrities are handed down from on high, whereas social media influencers are chosen by the masses through likes, follows, and views. This means that anyone can be a social media influencer. Michelle Phan is a Lancome makeup artist who grew her social media following to include 9 million YouTube subscribers and 3.2 million followers on Facebook and it all started with honest and easy to follow makeup tutorials. People want to watch videos about things they care about made by authentic people to whom they can relate, and this is what gives social media influencers their power. Social media influencers have to watch out for their personal branding and safeguard their personal brands against any messages that might go against their established personas. They have to make sure they remain consistent both in message and in interacting with their followers throughout the process. There are also legal obligations to consider. The FTC wants to make sure that followers know they are watching an ad, so influencers must make it clear they are being paid to make a post on social media. This is typically where you see things like #ad and #sponsored. Thanks to ad blockers it is harder than ever to get your message in front of consumers online. In fact, by 2020 ad blockers are expected to gobble up $12 billion in online ad revenues. This is where social media influencers come in. Thanks to their already established relationships with their followers, social media influencers are in a unique position to get advertisers’ messages out in a responsible and authentic way. Early on in the influencer marketing game just making a post for your thousands or millions of followers was enough to satisfy marketers. Now they expect measurable results. Sometimes these results can be in the form of community engagement from your followers, but sometimes actual measurable sales are expected to come of an influencer marketing arrangement. This allows for long term agreements for those social media influencers who are able to prove their worth. But what is even more valuable for established influencers is their ability to go to a new company and make more money if there aren’t long term contracts in place. Remember the cell phone company guy who spent over a decade finding out whether you could get reception everywhere? He’s working for another cell phone company now. Even smaller level influencers are getting in on the action. Spreading a marketing budget across a handful of lower level influencers is starting to be a more preferred method for getting your message out to followers. Smaller scale influencers are more likely to be viewed as authentic and to engage with their audiences. Above all else, influencers have to be able to maintain their authenticity. Social media has democratized fame. The people are calling all the shots, and brands are starting to take notice. If your brand isn’t engaging with followers via social media and influencers, you are going to get left in the dust. 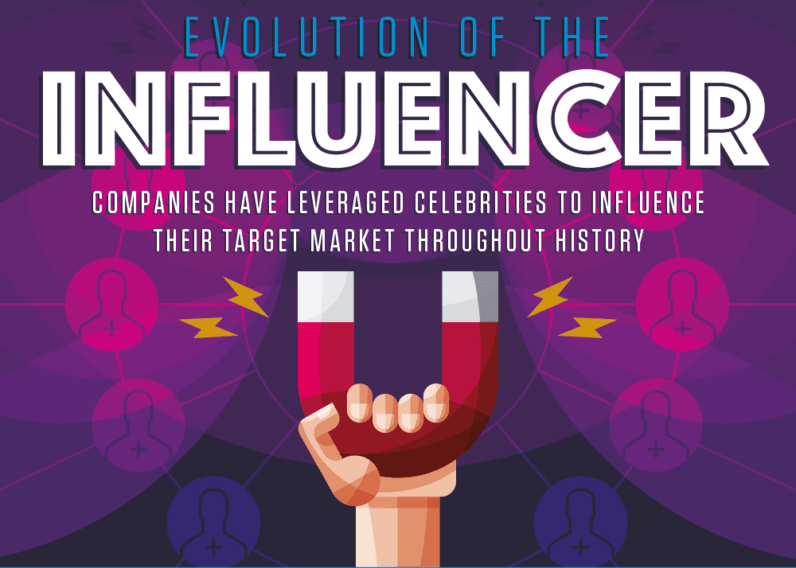 Learn more about the evolution of social media influencers from this infographic from No GRE.